Salaterka is for me the perfect Arabian when it comes to her conformation, Arabian type and most important - her disposition, wonderful with people and an amazing mother. And she is so great to ride and work with. In november 2013 Salaterka was seriously injured out in pasture with a serious fracture that caused her to be in her stall for almost 7 months. She was calm and really handled it really well and it was a relief when she could start to be outside in a small paddock on the 1st of May. I knew that I could never ride her again but I hoped that she could carry a foal as she would be devastated to not have her own foal. I bred both her and her daughter Silencia to Ganges in 2013 and on the 3rd of June 2014 Salaterka gave birth to a dark brown filly. Salaterka was so happy to spend the whole summer with her filly Sharda and Silencia and her colt Savitri. At the end of the summer Salaterka started to loose weight and she was lame on several occassions on different legs without any signs why. Me and my vet understood that it must be the old injury that gave her problem and we decided that she would get as long as she could with her baby but I knew that I was facing a very hard decision. Salaterka´s sire Elton was the Arabian of the Year in Harness Driving in 1998. His sire Etnograf is a son of the European Champion Engano (Eleuzis x Engracja) and out of the legendary mare Etna (Faher x Elzunia). Etna is the dam of the great stallions Etiw, Etan, Etap, Eternit and Etnograf as well as the mares Etruria – World, European and Polish Champion Mare and Equitana – Polish National Junior Champion Mare. Salaterka´s dam Sapala was my foundation mare and she was a daughter of 1983 Swedish National Champion Stallion Cadyk. Salaterka has got Cadyk in second and third generation which can be seen in her incomparable long and well-set neck, great body and as a bonus - her extraordinary long mane. Salaterka belongs to the celebrated Milordka dam line that traces down to the mare Saga 1936 (Hardy x Jaga II). Saga had two daughters by Amurath Sahib that created their own dynasties, the chestnut Estokada and the bay Sakla. Estokada produced great with Nabor (Negatiw x Lagodna) and Comet (Abu Afas x Carmen) producing the mares Eskapada, Estebna and Edycja by Nabor and the stallion Eter and the mare Estonia by Comet. Eskapada had 13 offspring, 7 sons and 6 daughters. Four sons found their way to the US, Escudo (by Kord), Eskimos (by Elf), Eros (by El Paso) and Estragon (by Gedymin). Her daughter Espada (by Aquinor) was on lease to Mike Nichols in USA 1978-1982 and was then shown to a 1978 US National Top Ten. Espada´s daughters in Poland, Emisja (by Carycyn) and Estancja (by Palas) have been invaluable for Michalow with daughters and granddaughters like Emigrantka, Emanacja, El Dorada, Estarda and Ekscella. Eskapada´s Celebes-daughter Ekstaza was named Polish National Champion Mare in 1981, the same year as Eskapada was awarded with the Reserve-title at 21 years of age. Eskapada was also the dam of Era (by Carycyn, the dam of the stallion Erykk MF), Epopeja (by Palas, the dam of Polish Chief sire Egon). Estebna (Nabor x Estokada) was the first European Champion Mare in Verden 1973. Sakla raced for two seasons at the racetrack in Warsaw and she raced 19 times (2-7-4). She had two foals at Michalow and then she moved to Janow Podlaski where she had a filly by El Trypoli, Sake, in 1962. The same year she was sold together with Sake to Gåvetorp in Sweden. Sakla had three foals at Gåvetorp and in 1967 both Sakla and Sake was sold to Blommeröd. Sakla had five offspring at Blommeröd prior to her death in 1975 and her daughters Cesa and Saceruczka (both by Cedr) has been great broodmares. 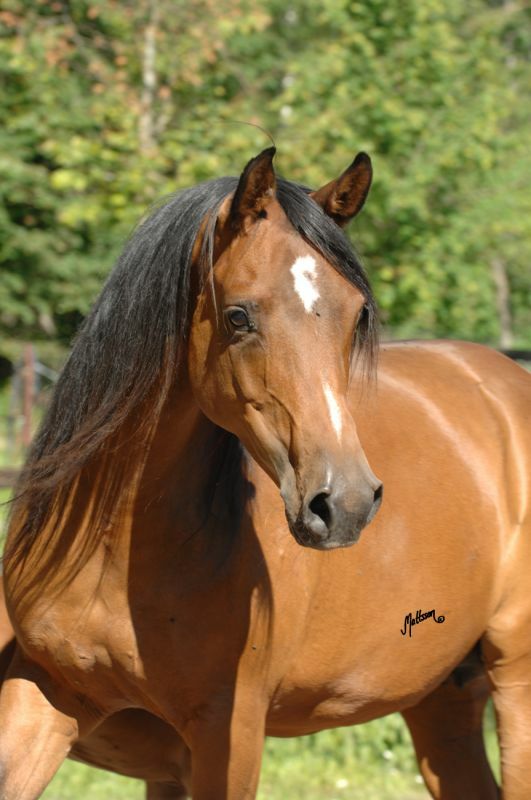 Today it is the descendants of Cesa that are Blommeröds stars, including Magora and Marylla (exp to Middle East), Malagant (Swedish National Junior Champion Colt and sire at Blommeröd) and the great Gazal Al Shaqab-daugthers Migracja and Maranta – valued broodmares at Blommeröd. Sake had 7 foals at Blommeröd (of which 2 unfortunately died as foals) before she was sold to Chauncey Arabians in USA in 1974. Her daughter Salexja (by Exelsjor) took her dam´s place in the broodmare band and although that Salexja only had 8 foals at the farm, her impact has been huge. Her daughter Polka (by Pohaniec), Sanda (by Dardir), Salamalaika (by Algier) and Sagana (by Engano) has all been great broodmares. Polka is the dam of the stallions Polak (by Engano) exported to USA and Primo (by Engano), Swedish National Champion Stallion and chiefsire at Janów Podlaski in 1998-1999. Sagana is the dam of the great mares Sadza (by Rusazcie), Prosba (by Probat) and Szansa (by Rusazcie), all three Swedish National Champions and Sadza is in her turn the dam to World Champion Medalj (by Menes). Salamalaika is the dam of Saldara (by Dardir), the dam of Saleta – 1988 Swedish National Junior Champion Mare and Sargasso – 1998 Swedish National Reserve Junior Champion Stallion.